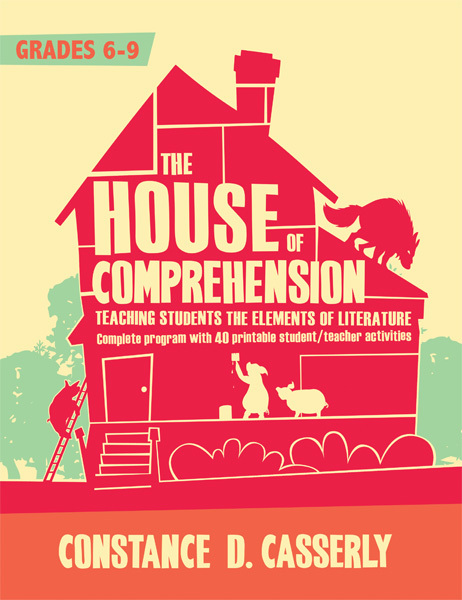 The House of Comprehension is a complete guide for English Language Arts teachers to help teach students how to understand structure in litera­ture. The elements of literature—character, plot/conflict, setting, theme, symbols, point of view, and tone—are the building blocks of the “house of comprehension.” Each element contributes to the entire piece of literature, and students must learn what they all mean in order to fully comprehend the literature. Just like the Three Little Pigs, students need to know how to build strong “houses of comprehension” that expand their knowledge, enhance their perception of the structure of texts, and develop strong reading skills that will last a lifetime. No Big Bad Wolf can blow down a student’s house of comprehension once a teacher uses the ideas laid out in this book! Every activity in The House of Comprehension addresses one or more Common Core Standards for Reading, Writing, Speaking & Listening, and Language, grades 6 through 9.